Note: This is day 25 of National Preparedness Month . Follow this year’s campaign on Twitter by searching for the #NatlPrep hash tag. This month, as part of NPM17, I’ll be rerunning some edited and updated older preparedness essays, along with some new ones. Ten years and more than 11,500 blogs ago, in Hickory Farms Will Hate Me For This, I began promoting the idea that - instead of gifting cheese platters, fruitcakes and ugly sweaters - we should be giving our loved ones preparedness items for holidays, birthdays, and anniversaries. 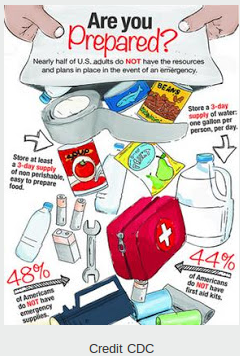 As the CDC graphic above illustrates, nearly half of all Americans families don't even have the basics to deal with a short term emergency, much less a major disaster. This was driven home for me a little over two weeks ago when Hurricane Irma was bearing down on Florida, and I saw thousands of Floridians going from store to store, desperately seeking flashlights, bottled water, and batteries. Over the past decade I’ve made it a point - in addition to securing my own preparedness items - to give water filters, LED lanterns, NWS weather radios, MREs, batteries, first aid kits, and emergency stoves to friends and family. Things that most people know they should have, but will rarely go out and buy for themselves until a threat appears on the horizon - and then it may be too late. Most of these items are inexpensive - many under $20 - but are invaluable when you really need them. Products mentioned or pictured below are to provide a general idea of the type of gift, and should not be viewed as an endorsement of one brand over another. I often find these gifts on sale in discount stores, bargain basements, and flea markets, and stock up whenever I come across a good deal. Sometimes I make the gifts myself, as when several years back I put together some first aid kits, and distributed them to a number of friends and relatives. You can either put one together yourself, or purchase one already assembled. 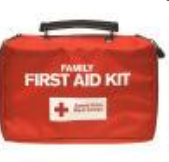 Trust me, there is no substitute for having a well stocked first aid kit when you really need one. A couple of years ago I also bought several 5 gal. buckets (with lids) from a home improvement store, along with mylar bags and oxygen absorbers from Amazon, and put together some long-term food storage buckets for friends. Cost per bucket? About $30. But enough food to keep two people going for ten days or more in an emergency. I keep a couple on hand (one for me, one for the cat), myself. Anyone who knows me knows that I have a particular interest in (ok, its more of a fetish for) LED flashlights and lanterns. Probably because I lived so many years aboard a sailboat in the tropics with hot, smelly kerosene lanterns. LEDs are far preferable to many other light sources because they run a very long time on batteries, they don't pose the fire hazard of candles or kerosene, and they don't produce heat or fumes. A couple of years ago I ran across a display of LED light sticks, with three modes of light, and a built in whistle. The button batteries promise 200 hrs of running, but even if they last half that, at $3 each they were a bargain. I bought 5 to test out. One for my car, one for my bug out bag, and three for stocking stuffers. Since then, I've bought several more. My collection of LED lights continues to grow, and the best part is none of the items pictured below cost me more than $5 each. My local Walmart has LED flashlights for $1 apiece in the sporting goods section; cheap but serviceable and a great stocking stuffer. High on the list of things to have is a way to make water potable. Although (unscented) bleach will work, it requires measuring, and imparts a taste to the water many dislike. An option that has gotten a lot less expensive in recent years are filtration systems, like the LifeStraw ®. At just 2 ounces, this personal water filter will reportedly filter 1000 liters down to .2 microns. Not bad for around $20. I've recently added the Sawyer Mini-Filter to my preps, again about $20. Speaking of water, having a way to store enough water for three days (1 gal/person/day) is essential. A family of 4 will need at least 12 gallons for 72 hours. Personally, I keep enough on hand for a couple of weeks. While there are plenty of `free options’ – like rinsed and recycled 2-liter plastic soda bottles or other food-safe plastic jugs – you can also buy collapsible 5 gallon containers. I also picked up a few single burner Propane stove units on sale for $10 each. Add a couple of 1 pound propane cylinders (about $3 each) and you can cook for a week. Every home should have a battery operated radio (with NWS weather band), yet many do not. Some are available with crank or solar charging. In any event, you'll want something which can pick up the NOAA NWS Emergency Broadcaster in you region. As I’ve described in Preparedness: Solar Power On A Budget, it is a relatively easy task to set up a simple solar charging system. No, you won’t keep the A/C or refrigerator running on a budget system, but you can keep your LED lantern batteries, cell phone, iPod or iPad, or notebook computer running. In recent years I'm seeing reasonably priced `briefcase’ solar panels – often for between $50 and $80 – that, when unfolded, can charge a 12 volt storage battery with up to 13 watts of power. Add a $20 inverter (converts 12 volt battery power to 120v AC), and you can do a heck of a lot. Last week I ordered an inexpensive USB solar charger/powerbank - along with a USB fan - which I'll be testing out before gifting to a friend for Christmas. For roughly $40 for the pair, I don't expect miracles, but I'm very interested to see how well it does. Something as simple, and as utilitarian, as a multifunction `Swiss’ army knife, a`Multi-tool’, a `plug in' auto 12 volt USB charger (see below), or even a good first aid manual, makes a great preparedness gift. A walk through any camping supply or hardware store will provide plenty of inspiration. Just ask yourself . . . what would you want if the power and water were out for a week or longer, and the stores were closed? Buy first for yourself, and then for a friend or a loved one. We need to cultivate a culture of preparedness in this country, and around the world. And we can start doing that, one gift at a time.